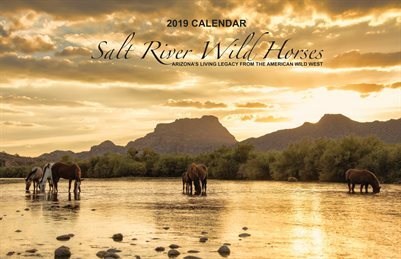 This is our large tabloid size version of our Salt River Wild Horses calendar for 2019. It's an unconventional calendar with very large bright images (11" tall x 17" wide) with smaller calendar transparent overlays (4.75" tall x 7" wide). Still a functional calendar portion but wow, what stunning images! Each page is heavy stock that are spiral bound on the side, like a book. The calendar is sturdy enough to setup leaning against a support or hung by a sturdier than average hook as the calendar does not have a hole for easy hanging.